We are living in a fantastic time. Technology is making leaps beyond anything that would have been imagined just a few years ago. The focus of energy is top priority around the world, and industries, science and research are creating some incredible results. One of the biggest jumps has been in the area of supercapacitors, which can affect everything from energy storage in our smartphones, all the way to electric cars. Researchers at UCLA are in the midst of pursuing a true miracle in energy storage, through the use of graphene for supercapacitor production. Graphene is a flexible, strong and very highly conductible carbon product that has the ability to store energy in a faster method than anything we currently have. To put it into perspective, the use of graphene supercapacitors could allow you to plug your cell phone in and have it completely charged in just a few minutes. Another idea for common use would be to have the ability to plug your electric car in, and instead of it taking hours, it will take only the amount of time it would normally take for you to fill your tank at the local gas station to bring a full charge. The problems faced in the past have been that the capacitors designed could charge quickly, but not hold the charge for any length of time. The supercapacitor designs charge quickly and maintain the charge, bringing efficient energy storage abilities for just about anything we will need it for. 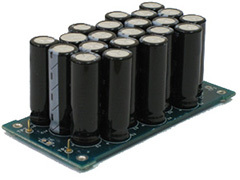 Moving supercapacitors into the micro supercapacitor world downsizes the technology, making these the design of the future. In the next few years, it is anticipated that the graphene style micro supercapacitors will be available and used in almost every market; from big corporate business, to our flashlights, cell phones and electric cars. Posted on June 10th under Renewable Electricity. Supercapacitors are the wave of the future. Without them, we are stuck in the clunky battery ridden world that is incredibly old school compared to the technologies that we have at our fingertips. Looking forward to seeing how this goes. Watched a program about the development of these supercapacitors. There are a lot of companies doing research and development but there seemed to be a lot of problems on the chemical processes and the overall size. Sounds like these guys have spent some good time and effort figuring out how to get around both of these problems. Glad to hear about this. Those people at UCLA really know what they are doing. So many scientists have been talking about this for years, but no one (until now) has come up with an answer. The whole idea of hybrid and electric cars has been great, with the exception of the batteries. Prices have come down from the originals, but they are still a hefty investment and people just don’t want that kind of expense. If the supercapacitors can add longer life, faster charging and a lower price, this is the kind of thing we have been waiting for.